Image: Marvel Comics. Art by Rod Reis. One of the biggest messes that still remains from the bleak fallout of Secret Empire is actually one of the event’s first shocking moments: the complete destruction of the city of Las Vegas, on Stevil Rogers’ orders. Now, Stephen Strange wants to try and fix it... but he only manages to make things much worse. 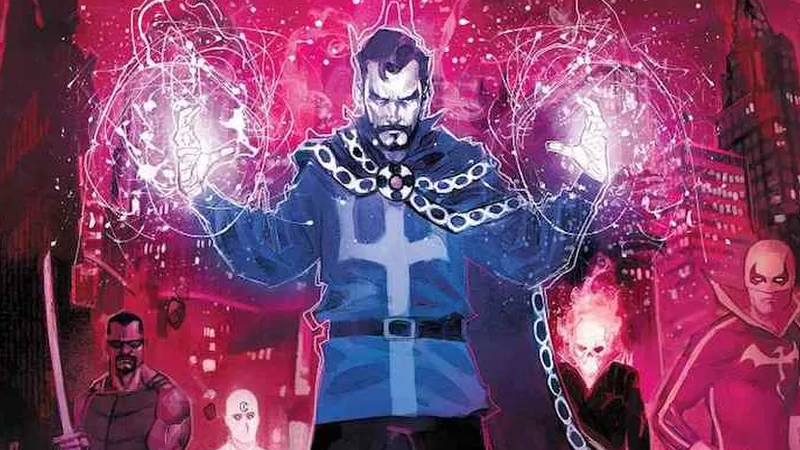 Doctor Strange: Damnation is a five-part miniseries from Secret Empire writer Nick Spencer, new Doctor Strange scribe Donny Cates, and artist Rod Reis, and sees Strange take a bold step to try and resurrect the fallen Vegas. As much as his current replacement as the Sorcerer Supreme doesn’t want to admit it, magic that gravely powerful in the Marvel universe comes with an even graver price: Doctor Strange ends up accidentally opening a portal that unleashes Marvel’s answer to Satan, Mephisto, on Earth. Suffice to say, it doesn’t go down well, leading to Strange recruiting a host of supernatural street-level heroes—Blade, Moon Knight, Ghost Rider, and Iron Fist—to stop Mephisto from making the rest of the world look like Marvel’s Las Vegas currently does. It’s an interesting way to deal with some of the fallout that still remains from Secret Empire... one that probably wisely skips some of the uncomfortable mess the series ended with to focus on something all comics fans can relate to, like magical superheroes punching the devil in the face. Damnation is set to begin in February 2018.